Iranian opposition supporters demonstrate at Tehran University's campus in December. Despite a February 15th United Nations review of its human-rights practices, Iran’s government has not curbed its censorship and repression of women’s rights activists. The morning after the review was held, Nasrin Sotoudeh, a prominent Iranian feminist lawyer, was detained by the Iranian government. Her alleged crime is “to have spoken with foreign media” about human rights violations in Iran. During the U.N. session, delegates from most countries—with the exception of Cuba, Venezuela, China, Russia and a few others—condemned the Iranian government’s treatment of dissenters, especially violence against women and religious minorities. Simultaneously, Iran censored portions of women’s rights websites and blogs reporting on the session. 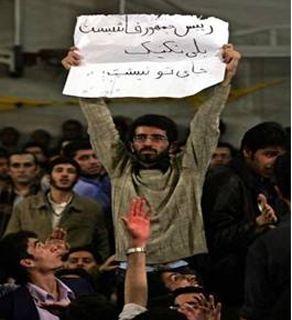 Yousef Rashidi, an Iranian political prisoner on death row, who was arrested on July 9 after holding a poster in one of Ahmadinejad's lectures in Politechnique University in Tehran stating 'Fascist President: Poly Technique is not your place!'. These latest cases of detention, intimidation and censorship come on the heels of a government crackdown on dissidence on February 11th, the 31st anniversary of the Iranian revolution. To thwart a planned demonstration by Iran’s pro-democracy “green movement,” the government shut down the Internet in parts of Tehran and other major cities. Meanwhile, state-backed, pro-government demonstrations were accompanied with utmost security measures enforced by the Basij (paramilitary forces) and Sepah (the Revolutionary Guard). Even so, shouts of “Death to Dictator!” could be heard during President Mahmoud Ahmadinejad’s speech, although few protesters were visible. According to reports by the opposition movement, thousands of activists, journalists, social scientists, students and ordinary citizens have been detained in Iranian prisons since the unrest over contested election results erupted in June 2009. The families of those imprisoned were repeatedly told to stay silent before the February 11th anniversary, avoid coming out in the streets and refrain from spreading news about potential protests. Many of these families still remember the threats they received from the government of the Shah of Iran before the 1979 revolution that led to the establishment of the Islamic Republic of Iran. Women’s rights activists have not identified themselves with the green movement, but that has not protected them from being the target of state violence since the June 2009 election. 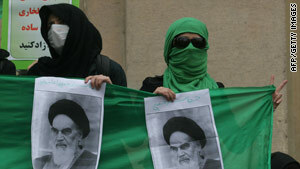 The growing list of women’s rights activists and other civil society activists in detention centers and prisons —such as the notorious Evin prison, first used by the Shah to suppress dissent—consist of secular as well as religious women, first-generation activists who fought against the Shah’s rule as well as young activists who have only known the current Islamic republic. Peaceful protests were a contributing factor in the Iranian revolution of 1979, and the right to peaceful protest is enshrined in the Iranian constitution. Yet 31 years later, peaceful protests are violently crushed. During these difficult times, Iranian feminists have drafted a letter calling upon women’s rights groups around the world to announce their solidarity with women in Iran. This is especially crucial now, when the right-wing Iranian parliament is preparing a bill that would severely set back gender equality. It would allow men a universal right to divorce, the right to have multiple wives, and right to set Mehrieh (the dowry a groom gives his wife in case of divorce). Women’s rights activists have proven their resilience one more time by opposing the ratification of this bill in the face of state suppression. If the tension over Iran’s nuclear program intensifies, the Iranian state will suppress dissent under the banner of “protecting national security” during war-like period. The Iranian authorities will exploit any opportunity to justify its crackdown on internal dissent by aligning dissenters with Western powers. Great article. Wish more Americans would read this article so as to understand how different things really work over on the other side of the world, it might help Americans not look at things from the American point of view which is based on how things in our country run.